JERUSALEM — When Israel locked up Ahed Tamimi for slapping a soldier last year, it hoped to finally silence the teenage Palestinian activist. Instead, it created an international celebrity. "We could have been smarter," said Yoaz Hendel, a media commentator and former spokesman for Prime Minister Benjamin Netanyahu. Tamimi's extended family has long been on Israel's radar screen. Nabi Saleh is home to some 600 people, most of them members of the clan. For years, they have held weekly protests against the expansion of a nearby Israeli settlement, gatherings that sometimes turn to stone-throwing, prompting Israeli troops to respond with tear gas, rubber bullets or live fire. For Israelis, the Tamimis are a group of provocateurs intent on manipulating the media to hurt the country's image. One cousin, Ahlam Tamimi, was an accomplice to a suicide bombing. Among Palestinians, they are seen as brave heroes standing up to Israel. But neither side anticipated the fallout from last December's standoff, which occurred during one of the weekly protests. As the cousin films the scene on her mobile phone, Tamimi's mother, Nariman, arrives. At one point, she steps between Ahed and the soldiers, but then also tries to push back the soldiers, who do not respond. Ahed Tamimi later said that she was upset because a cousin had been shot in the face by a rubber bullet fired by Israeli troops. In Israel, the incident set off its own uproar. While the army praised the soldiers for showing restraint, politicians felt the army had been humiliated and called for tough action against the young firebrand. Days later, in an overnight raid, troops entered Tamimi's house and took her and her mother away. Both were given eight-month prison sentences. Israel has traditionally been obsessive about defending its image — making the term "hasbara," which roughly translates as public relations, part of its national lexicon. But as the country has moved toward the right under the decade-long rule of Prime Minister Benjamin Netanyahu, charm has been replaced increasingly with confrontation. Netanyahu, an admirer of President Donald Trump, rarely speaks to the media anymore and often lashes out at reporters for what he believes is unfair coverage. Under his watch, Israel has tried to weaken liberal advocacy groups critical of his policies, detained Jewish American critics at the airport for questioning and banned people who boycott the Jewish state from entering. It attempted to expel an American woman who will be studying at an Israeli university, accusing her of being a boycott activist. She was held in detention for two weeks until Israel's Supreme Court overturned the expulsion order. "I don't like living as a celebrity. It's not an easy life to live. I'm exhausted," she said in a telephone interview from the Jordanian capital, Amman. "But what I like more is delivering the message of my people. That makes me feel proud." She kicked off her tour on Sept. 14 in Paris, where she participated in the Communist Party's "Humanity" rally. The popular weekend festival attracts rockers, rappers and other entertainers and celebrities. On the festival's last day, she spoke to thousands of cheering supporters. She traveled to other cities around France at the invitation of the France Palestine Solidarity Association. In Greece, she was a headliner for the 100th-anniversary celebration of the country's Communist party, KKE. Addressing a crowd of thousands, she was interrupted by several long ovations and chants of "Freedom for Palestine." "Your support means a lot to me. It gives me a big push to return to my homeland and continue my struggle vigorously against the occupation," she told the crowd. "Free people unite to face capitalism, imperialism and colonization ... We are not victims. We are freedom fighters." 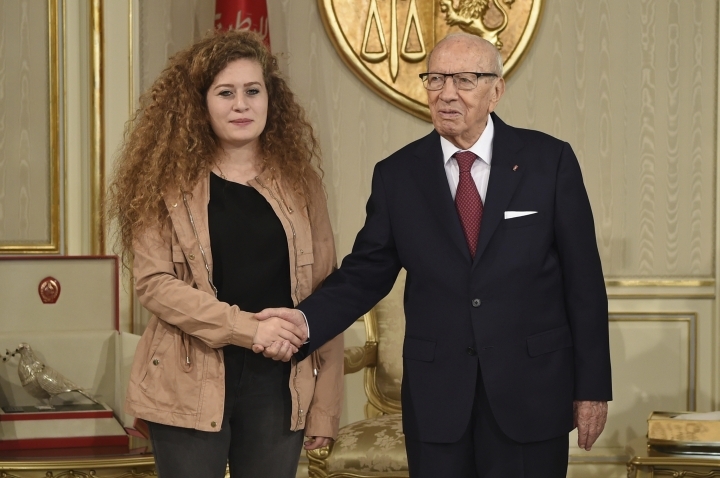 Her family was invited as official guests of Tunisian President Beji Caid Essebsi to mark the 33rd anniversary of the Israeli bombing of what was then the Palestine Liberation Organization's headquarters. At the ceremony, Essebsi gave her a statue of a silver dove with an olive branch. Meetings with Jordan's King Abdullah II and Turkish President Recep Tayyip Erdogan are in the works, said her father, Bassem Tamimi, who has been accompanying her. 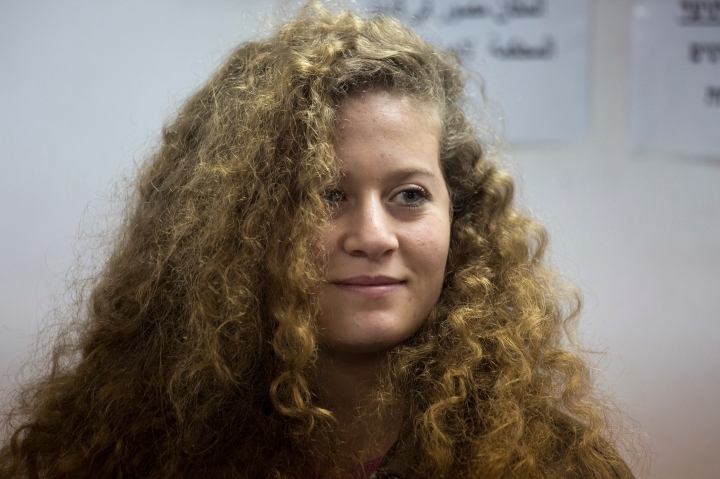 "On the Champs-Elysees in Paris, we were surrounded by hundreds of people who wanted to talk to Ahed and take pictures with her," her father said. "The same thing happened in every other city we visited." "I want to be a regular 17-year-old. I like clothes, I like makeup. I get up in the morning, check my Instagram, have breakfast and walk in the hills around the village," she wrote. "But I am not a normal teenager." Israeli officials have remained silent throughout her tour — with one exception. Tamimi's reception at Real Madrid, where she met the legendary striker Emilio Butragueno and received a team jersey with her name on it, was too much to bear. Foreign Ministry spokesman Emmanuel Nahshon called the team's embrace of Tamimi "shameful" in a Twitter post. "It would be morally wrong to stay silent while a person inciting to hatred and violence goes on a victory tour as if she is some kind of rock star," he said. Michael Oren, Israel's deputy minister for public diplomacy and a former ambassador to the United States, learned a bitter lesson when he acknowledged earlier this year leading a secret investigation into whether the Tamimis were "real" Palestinians. He said their light features, Western clothes and long history of run-ins with Israeli forces suggested that they were actually paid provocateurs out to hurt the country's image. The investigation concluded that the family was indeed real — prompting mockery and racism accusations from the Tamimis. "Israel is unhappy because she highlights to the world both how unjust the occupation is and how absurd their legal system is," said Diana Buttu, a former legal adviser to the Palestinian Authority. "Israel instead wants subservient Palestinians who simply stay quiet in the face of the denial of freedom. 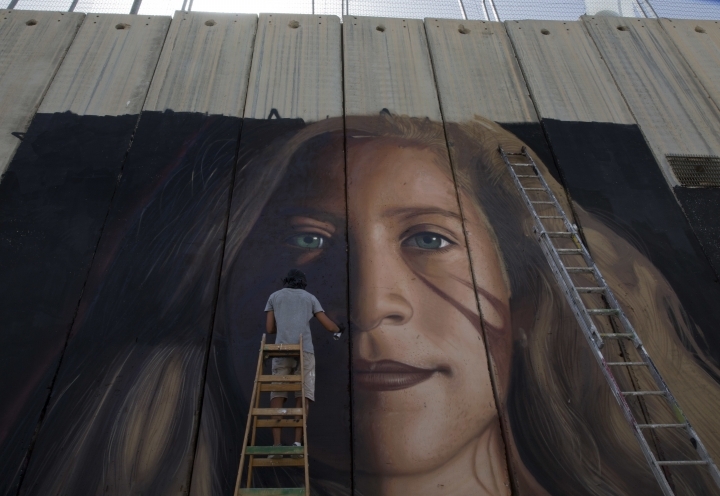 Ahed shows that won't happen — including not with this generation." Hendel, the former Israeli government spokesman, said he initially supported Israel's tough response to the slapping incident but now thinks it was an error. He said issuing a fine or punishing her parents for their daughter's actions might have generated less attention. "She's powerful, part of a sophisticated machine that tries to delegitimize Israel by using photos and creating scenarios that portray Israel as Goliath and the other side as David," he said. "It is much easier to fight terrorism than to fight civilians motivated by terrorist leaders. I think Tamimi in this story is a kind of a front line for a much bigger organization, or even a process." "International law is a strong tool to defend my people," she said. "We are under occupation and we have to rely on international law to get the world behind us."